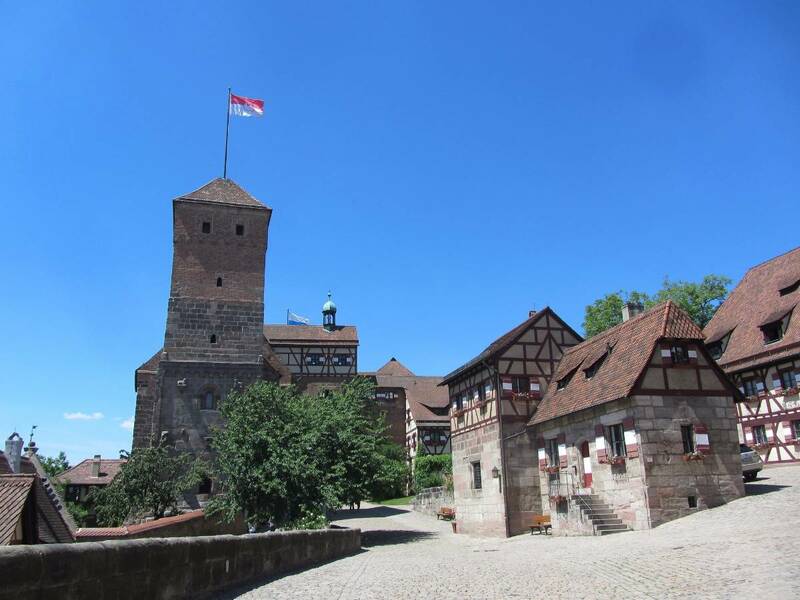 Top sights in Nuremberg, Germany include the Kaiserburg Castle, interesting museums, churches, old town, and sights associated with the Nazi party rallies and trials. Nuremberg, the second largest city in Bavaria, Germany, has many interesting sights to see. 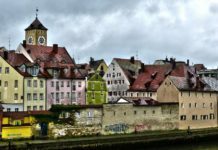 The city was of major political and economical importance during the Middle Ages but is also associated with events surrounding the Second World War: the Nazi Party rallies, the air raids of 1945, and the Nuremberg trials. The correct German for Nuremberg is Nürnberg, which may also be written as Nuernberg. Nuremberg’s old town is still encircled by its original medieval walls – around 5 km (3 miles) long. In total, 71 of the original 130 defensive towers survived. The Pegnitz River cuts the old town of Nuremberg in two. The part closest to the Hauptbahnhof (Main Station) is called Lorenz while the northern section where the Kaiserburg is located is known as Sebald. The Kaiserburg (Imperial Castle) is on a hill in the far northwestern corner of Nuremberg’s old town. The Kaiserburg was only used when the Holy Roman Emperor of the German Nation was in town. Between 1050 and 1571, every emperor visited Nuremberg at least once. Over 300 imperial visits took place with Karl IV visiting Nuremberg around 40 times while Ludwig the Bavarian came 70 times. Nuremberg is at its most romantic at the Tiergärtnerplatz. 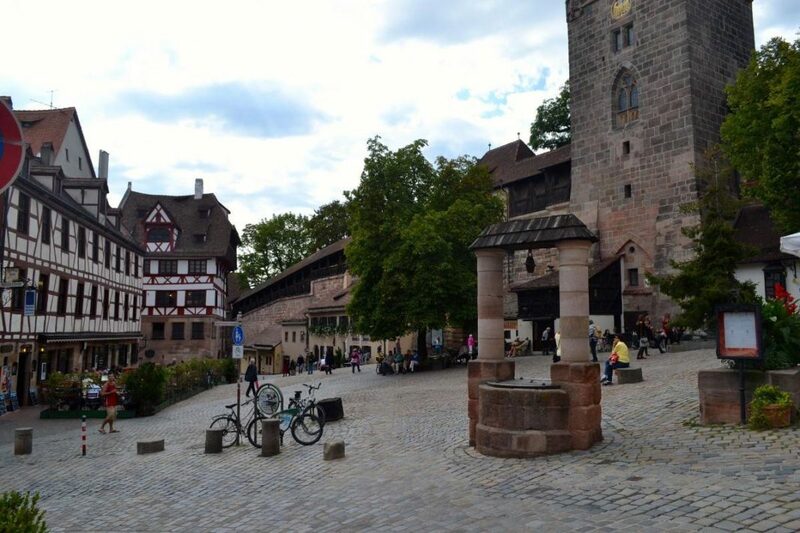 This square is below the castle with medieval surroundings that include the castle, town wall, town gate, and half-timbered buildings. The most famous is the Albrecht-Dürer-Haus, a museum in the house where German Renaissance artist Albrecht Dürer worked and lived. This house escaped the destruction of the air raids of January 2, 1945 when 90% of Nuremberg’s old town was destroyed. On the Hauptmarkt (Main Market) is a copy of a 14th-century Gothic fountain – the Schöner Brunnen. The Frauenkirche (Church of Our Lady) here is a 14th century Gothic hall church. 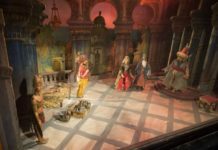 More interesting than the church is the Männleinlaufen, a mechanical show on the main façade of seven men representing the Prince Electors paying homage to the Holy Roman Emperor. They come out daily at noon. Architecturally the nearby St Sebalduskirche is a more interesting church. Its exterior is an uneasy combination of the Romanesque and Gothic although the interior is much more harmonious. The St Lorenzkirche, a High Gothic church, was mostly rebuilt after 1945 but the impressive art is original. The Handwerkerhof at the gate tower closest to the Hauptbahnhof is a restored medieval-look area with arts and craft shops as well as restaurants. 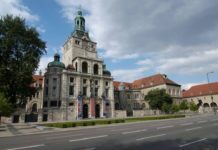 The Germanische Nationalmuseum has the largest collection of German art and cultural objects in the world. The Verkehrsmuseum (Transportation) has the largest collection of historical railway equipment in Germany. The Neues Museum has an impressive collection of modern art and design objects. The Spielzeugmuseum has a large collection of toys. Nuremberg, Germany is infamous for the Nazi Party rallies that were held here during the 1930s. The weeklong rallies were a mix of endless speeches, parades, a folk festival, sporting events, and military tattoos. The rallies were an opportunity for the Nazis to show of their might and to influence friends and foreign powers. 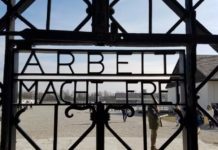 Why the Nazis Chose Nuremberg? Nuremberg’s excellent railway links to the rest of Germany was probably the main reason for the Nazi Party’s decision to hold party rallies here in 1927 and 1929. Crowd trouble at the 1929 rally led to a ban on further rallies. However, in 1933 the Nazis took power in Germany and soon after decided that annual party rallies would be held in Nuremberg. By then, the symbolic connection of Nuremberg to the old Holy Roman Empire of the German Nation was probably more important to the Nazis than the relatively easy transportation logistics. From 1933 to 1938, six Nazi Party rallies were held in Nuremberg. The 1939 rally with the motto “Party Rally for Peace” was scheduled to begin on September 2 but was cancelled without stating reasons on August 26. 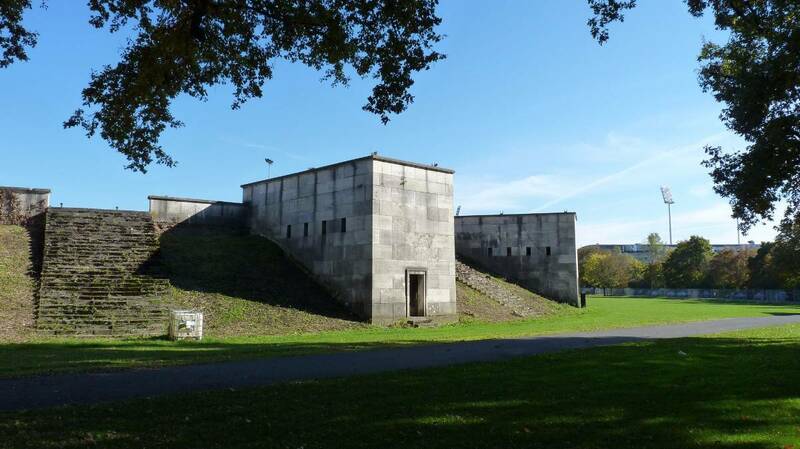 In order to stage the annual rallies, the Nazis erected a huge complex of monumental buildings to the south of Nuremberg. 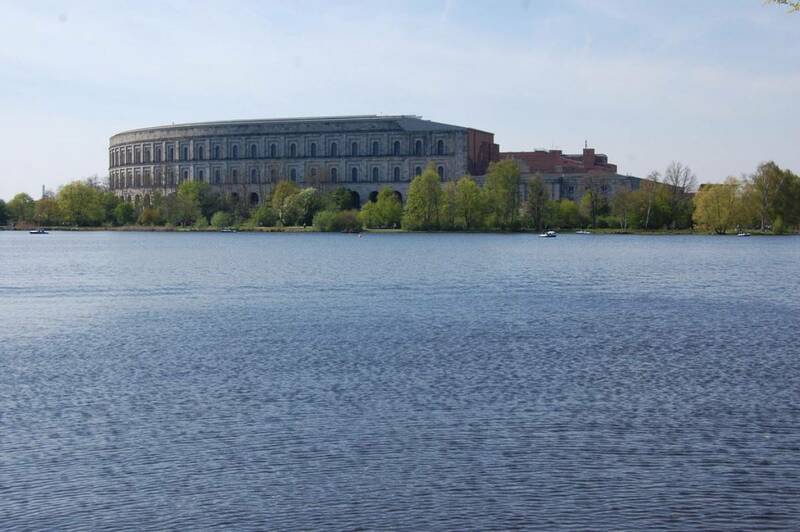 This so-called Reichsparteigelände (Nazi Party Rallying Grounds) designed by Albert Speer was under construction, using mostly slave labor, as late as 1945. The Dokumentationszentrum Reichsparteitagsgelände (Documentation Center Nazi Party Rallying Grounds) is inside a small part of the Kongreßhalle. This very informative, if eerie collection of photos, video, audio recordings, and models give a very good overview of the party rallies as well as the Nazi regime. Visit this center first for an explanation of the rallies as well as of the lay of the land. The Nazi Party rallies were a logistical nightmare – the last one was attended by 1.6 million. 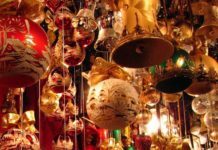 In the documentation center are priceless comments on the inadequate toilet facilities, attempts of senior party members to enter the red light districts, and complaints that bars playing dance music were better attended than those relaying Hitler’s speech. The Documentation Center Nazi Party Rallying Grounds is open daily from 9 am (10 am on weekends) to 6 pm. At the back of the Congress Hall is the Große Straße (Great Road), a 2 km (1.2 mile) long road build with 60,000 slabs of granite. This road was a central axis and in line with the Kaiserburg, once a premier residence of the Holy Roman Emperor. The American army used this road as a landing strip after the war. Currently most of it is used as parking lot for the nearby modern conference center and sports stadium. The Zeppelin Tribune is the main, 300 m (1,000 ft) long tribune from where Hitler addressed the party faithful. The main and side tribunes provided seating for 60,000 while the field itself had space for a further 100,000. After the Second World War, 21 top Nazi leaders went on trial at the International Military Tribunal – better known as the Nuremberg Trials. The trials were held in the Nürnberg-Fürth courthouse in Schwurgerichtssaal 600. Nuremberg has good transportation connections to the rest of Germany and Europe. Nürnberg Airport (NUE), a major hub of low-cost airline Air Berlin, can be reached from the old town by subway in 12 minutes. The Hauptbahnhof (Main Station) is to the south of the old town. Frequent trains to Frankfurt am Main take 2 hours while Munich can be reached by rail in 90 minutes. The Nazi Party Rallying Grounds is to the south of Nuremberg’s old town but not within easy walking distance. It is easiest reached from the Hauptbahnhof (Main Station) on tram 6 or 9 – stop Dokumentationszentrum is directly in front of the Kongreßhalle.